Tuesday, April 8, 2008 ~ 5:00 p.m. Presentation from Proponents of the Sixth Street Station Project Regarding the Timeshare/Hotel Component of the Project. 3) CONSENT AGENDA The listing under consent agenda is a group of items to be acted on with a single motion. The consent agenda is designed to expedite Council business. The Mayor will ask if any citizen or council member wishes to have any specific item discussed. You may request that an item be removed from the Consent Agenda at that time, prior to Council’s vote. Items removed from the Consent Agenda will be considered under New Business. C) Approval of $500 Appropriation from the Town Council Venture Fund for Contribution to the Crested Butte Nordic Council Towards Construction of a Year Round Trail Extension (Mike’s Mile) To Connect the Lower Loop Trail to the Gunsight Bridge Parcel. D) Approval of An Appropriation in the Amount of $3,000 from the Town Council Venture Fund to the Office for Resource Efficiency for the Energy Summit. 7:03 4) PUBLIC COMMENTS Citizens may make comments on items not scheduled on the agenda. Those commenting should state their name and physical address for the record and limit comments to five minutes. A) Special Event Permit- Crested Butte Mountain Heritage Museum – Black and White Ball – July 2, 2008 on 4th Street between Elk Ave and Maroon Ave.
B) Special Event Liquor License – Crested Butte Mountain Heritage Museum – Black and White Ball – July 2, 2008 on 4th Street between Elk Ave. and Maroon Ave.
C) Special Event Permit – Mike Marchitelli’s Bayou in the Butte – June 14-15, 2008 at Town Park. D) Special Event Liquor License – Stepping Stones Children’s Center for Mike Marchitelli’s Bayou in the Butte – June 14-15, 2008 at Town Park. A) Consideration of Letter to the U.S. Forest Service in Support of a Special Use Permit for the Alfred A. Braun Hut System for the Addition of a Hut Between Star and Taylor Passes in the Gunnison National Forest. B) Consideration of Draft Letter to U.S. Forest Service Regarding the Proposed Expansion of Crested Butte Mountain Resort Ski Area onto Snodgrass Mountain. C) Ordinance No. 6, Series 2008- An Ordinance Amending the Town Of Crested Butte Watershed Protection District Ordinance. D) Draft Recommendation Regarding Kroft Property Lot Line Re-Alignment. E) Consideration of Proposal to Rezone the Zero Block of Elk Avenue. 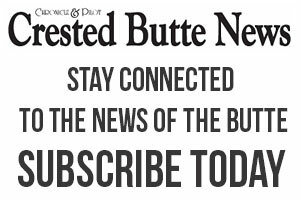 F) Consideration of Appropriation from the Town of Crested Butte Building Maintenance Fund in the Amount of $10,000 for the Town Buildings Light Bulb Replacement Project. • Monday, May 5, 2008- Regular Council Meeting. If you need special assistance to attend any of the Town’s public meetings, please notify the Town Clerk at 349-5338 at least 48 hours in advance. The indicated times are intended to be used as guides only. The order of items as well as the length of the discussion for each item is at the discretion of the Board. We advise you to be present at the beginning of the meeting regardless of the estimated times. PLEASE BE ADVISED that the following liquor and beer license renewals are pending. Complaints concerning the conduct of said licensee or employees of same should be directed, in writing, to Town Clerk Eileen Hughes, by mailing to Box 39, Crested Butte, Colorado 81224, or by delivery to same at Town Offices, 507 Maroon Ave., Crested Butte, Colorado. Complaints should be received on or before the date noted next to the establishment. Published in the Crested Butte News. Issue of April 4 and 11, 2008. #040411.